I recently went on a bush craft survival course while at the ranch. It was something I was very interested in doing while I was here. When you live in populated areas with all of life’s modern conveniences surrounding you, it’s easy to neglect the need for survival knowledge but when you are living off the grid it brings it home just how important this knowledge could be. We had two very experienced gentleman to help us gain this knowledge on our bush trip, our lead guide Nick and his assistant Rob. They made the whole experience extremely interesting and a lot of fun. Before heading into the bush we needed to know what to bring with us, a survival kit if you will. The essentials for going into the bush are the 5 C’s; Cordage, combustion, container, cutting tool and cover. Cordage is used to tie up a shelter, it is possible to make cordage in the bush but when time doesn’t permit, it is a very useful addition to your survival kit. Combustion gives you the ability to create and build a fire. When you are in the bush, it is vitally important to stay dry and warm. Cover is extremely important. Anytime you go into the bush your kit should contain a cover for an unexpected overnight stay or even just getting caught in the rain or snow. 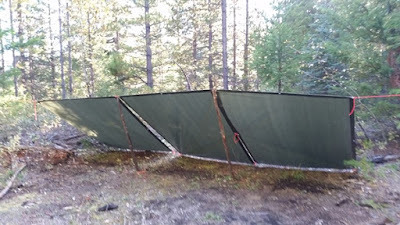 A lightweight tarp you can throw over some branches can protect you from the elements or even animals without adding unnecessary weight. So these are the essentials for putting together a survival kit. These should keep you prepared to handle most situations out in the wild and keep you safe. When you look at it, it’s not a lot to think of or carry, very easy, simple, inexpensive things that could save your life if you ever got caught out in the wild.